When Paul begins to work in a new location, he often visits a local synagogue first. But when Paul arrives in Philippi he visits worshipers by a river because there was no synagogue in the city. Access to water was an important factor for Diaspora Jews, so it is not unusual to find a group worshiping at a river. Since Luke calls this “a place of prayer,” Keener suggests this is not a group that would normally constitute a synagogue (3:2387). Since Paul talks to the women at the river, it is possible this is a group of Jewish women gathered to pray on the Sabbath. It is somewhat ironic Paul responds to a vision of a man calling him to preach in Macedonia by visiting a group of women praying on the Sabbath. Lydia was worshiping with the Jewish women outside of the city near a stream. 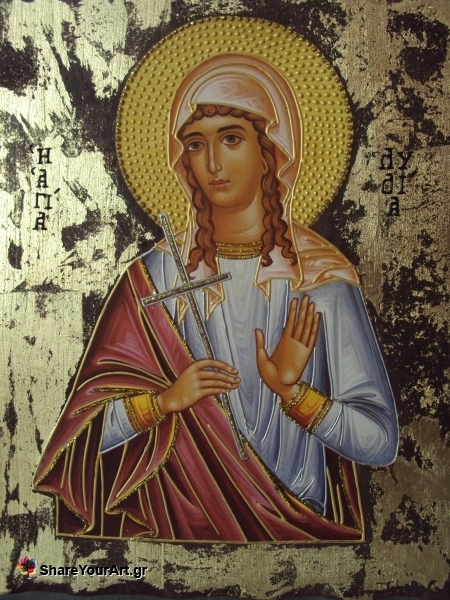 She is identified as a “worshiper of God” (σεβομένη τὸν θεόν) from Thyatira, implying she was a Greek who was attracted to the practice of Judaism. Gentile women were often attracted to Judaism, so much so that Celsus could complain Christian spread through women (Keener 3:2391). It is possible Lydia was a wealthy freedwoman and perhaps a widow. She invites Paul and his travelling companions to her home, which implies a larger than average home, Keener suggests a domus, a Roman house with an atrium with ample space to host a new church (3:2404). While she was probably not among the elite of the city, Luke does include several reports of prominent people accepting the gospel in the book. Since her husband is not mentioned in Acts 16, it is possible Lydia was widowed, giving her some wealth and independence. Some have understood her job as a “seller of purple” is sometimes taken to imply a higher-than-average status. She ran an export business moving purple-dyed goods from Thyatira to Philippi. Purple goods were costly, so there is an implication that Lydia was wealthy. Sellers of purple are sometimes included in “Caesar’s household” (NewDocs, 2:26). Since Lydia is a Greek woman worshiping the God of Israel, she is a close parallel to Cornelius in status. This is another intentional parallel between Peter and Paul: both preach the gospel to a prominent God-fearer. Luke says “the Lord opened Lydia’s heart to believe.” This is similar to Luke 24:45; Jesus opens the hearts of his disciples so that they could understand the scripture. Lydia believers because the Lord enables her to understand and accept the Gospel as Paul preached it. A similar usage appears in 2 Macc 1:4, may the Lord “open your hearts” (διανοίξαι τὴν καρδίαν ὑμῶν) to understand his commandments. As a result of Lydia’s faith, her household comes to faith in Jesus and she offers hospitality to Paul and his ministry team. Keener considers this a potentially “scandalous hospitality” since teachers who attracted too many female followers were suspicious. But in the context of Luke 16, a male prison guard will also offer hospitality to Paul (16:34). Like the members of the Jerusalem church selling property to support community, Lydia opens her home and (apparently) hosts the growing church at Philippi. There are several reasons the story of Lydia is important in Acts, but also as a point of application when reading the book of Acts. What does Paul reaching out to this particular woman say for “doing church” today? How can this story be a model for ministry?